For many people, myself included, moving into the world of rebreather diving is a decision made over at least a few months, if not a year or two. It involves a lot of time spent on research into different units, deciding which style you want, what your budget is, what kind of diving you are going to use it for, test diving (if possible), choosing a unit, then second-guessing yourself and doing all of the research over again. Sometimes you get certified in one unit and decide that it isn’t the one for you. Sometimes you get it right the first try, or at least think you got it right. I made the decision to buy a KISS Sidekick for various reasons. I am glad I did, but as time goes on and our experience, skills, and knowledge develop, opinions change. While I would tell past Jake to make the same decision, I would do it for different reasons. My first exposure to closed circuit rebreathers (CCR) came when I did a test dive on a Poseidon VI. While it wasn’t the most amazing experience, being an open circuit (OC) technical diver, at the very least I saw the benefits of CCR’s when it came to helium costs. Later that year, I had the opportunity to be trained on the Poseidon. After putting some hours on it, it was clear what my first criteria were going to be. Diving is often done in relatively remote locations, and I did not want to miss diving days because of a unit malfunction. 1) It needed to be extremely reliable, and easily serviceable (ideally by myself). While the Poseidon was not the unit for me, it did teach me enough about rebreathers and how they function that combined with a bit of reading I felt more confident in my ability to research other units. I had two main reasons for this. First, electronics inherently meant a higher difficulty when it comes time for servicing/troubleshooting(See criteria #1). Secondly, it is easier to become complacent when something does the job (managing your partial pressure of O2 [PO2]). I had been extremely impressed with how good the Poseidon held P02. While it was functioning properly, the P02 was just about as reliable as the sun rising in the morning. I became worried that after more time diving it, I may become complacent. I soon after learned that many divers use the setpoint as a “parachute” or “backup” and maintain their P02 manually. That being said, I didn’t know this was so common at that time, so it wasn’t a factor to me. We’re all beginners at some point. Being a 22-year-old dive instructor working in Central America at the time, I had limited money. Not only are rebreathers expensive, but service and maintenance aren’t cheap either(Again, see criteria #1). In hindsight, the cost of the Sidekick allowed me to start building experience on the loop at least a year or two earlier than otherwise would have been possible. This alone justifies the cost of buying a unit to me. It also allowed me to do more trimix diving. As mentioned earlier, one important factor is what kind of diving you are going to be doing. For me, that was going to be cave diving and technical diving. After becoming a technical diver and instructor, and nearly 1500 dives under my belt (2-4 dives per day, nearly every day adds up quick! ), I decided that I would move to Mexico in the near future. Mexico has an association with sidemount, and whether that is valid or not, a sidemount rebreather seemed to fit the bill. Sidemount rebreathers have their limitations of course; they are just different limitations than a backmount unit. Also, the concept is pretty damn cool if you ask me. This brought me to the KISS Sidekick. I did a bit of research into instructors and landed on Jonathon Bernot of Cave Country Dive Shop. I spent two intense, learning heavy weeks with Jon in Florida, then took my unit back to Honduras and did some ocean diving on it ranging from 5-80m. Since then, I have taken the sidekick into many places that back mounted rebreathers simply could not go. Low bedding planes, major restrictions, breakdown piles, all become possible. It also makes restrictions that back mount could pass through with some effort, much simpler. First is Sistema Kan Ha south of Tulum. It has very small/silty sections, tight squeezes, breakdown piles, awesome passages with haloclines running through them, varying between 6-24m deep. 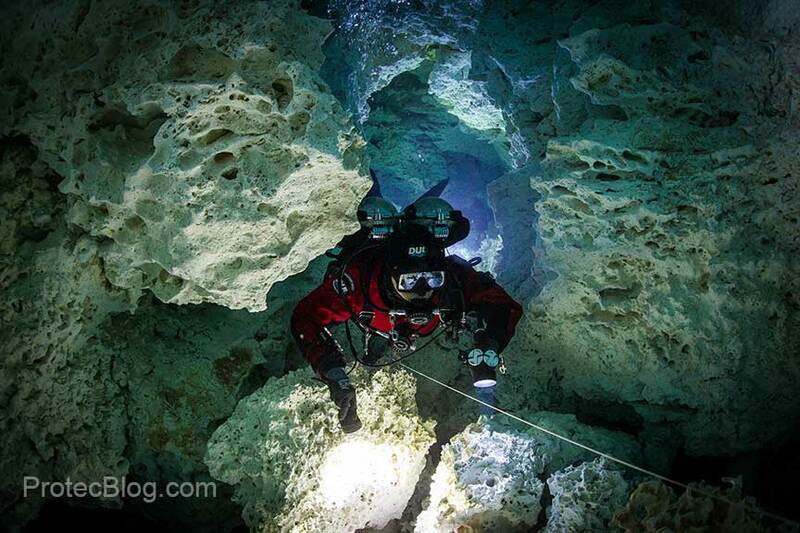 An awesome testing ground for sidemount ccr diving, and even has some bones to see. As you progress, there is always more to see there that was previously unreachable. The second is Sistema Regina. This is my favorite cave here in Mexico, offering everything from small silty passages to big saltwater tunnels. With a max depth of 37m, rebreathers make a big difference. I spent a few weeks diving it every chance I could. I always go check out spaces with no line in it out of curiosity and found myself very stuck in a restriction(that walled out on the other side) at 28m/90ft. With the unit on the left, and bailout/diluent in front of me, it was already a pretty tight space, and it quickly became completely silted. After a few minutes of trying to reverse myself out, I tried another method. I slowly unclipped/unbungeed the rebreather and switched to OC. I was then able to reverse out quite easily, orient myself on the line, attach the rebreather, switch back to the loop and swim out of the small room before the restriction. Looking back, it was a bit ambitious to try and fit, but the Sidekick made it a lot more manageable. Later that week, I tied into an End of Line (EOL) and swam off to look at the rest of the room. On the right, I found a hole that drops about 6m/20ft into a saltwater passage! Unfortunately, it quickly ended in a breakdown about 150ft later, but it was my first taste of new passage. However, I was on the sidekick, so I took a look. I ended up heading home that day but have returned since to find a bedding plane on the other side. While exiting I found myself face to face with bones! Thrilled, I sat there and examined it for a few minutes before turning around. It was about 50cm long, with a triangularly shaped skull. My first guess was a snake, or one of the local iguanas, who knows. There is also another pile nearby with a skull about 15cm long on top, with teeth still intact. Whatever they are, they have been there for a very long time as it is at least a 90-minute swim to the nearest cenote. The bedding plane is way too small for backmount units and made me appreciate the sidemount CCR that much more. Looking back, I couldn’t be happier with my decision to buy a KISS Sidekick. However, it has its pros and cons just like anything else. As mentioned earlier, my viewpoint on it has changed since I bought it. –	Work of breathing increases drastically when in an increased head up or down trim. Some vertical restrictions can be quite uncomfortable. – Designed for sidemount from the start. Check. Sidemount CCR’s dive quite differently than backmount units. With the counterlung on your side, breathing in/out changes your lateral trim, which can be a bit awkward at first. It also means that the diver must be stricter about maintaining minimum loop than normal to avoid diving with a giant balloon on one side of you. Previous experience with sidemount is a must, and a rebreather background helps. However, with proper training and consistent practice, it is just like learning anything else.